Shop opening hours :- Monday to Saturday = 10.00 am. until 4.00 pm. 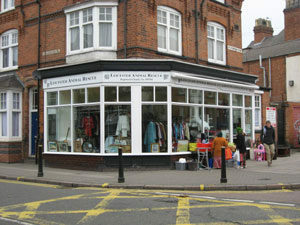 The charity shop situated on the corner of Evington Road / St. Stephens Road, aims to raise as much as possible to assist with the funding of our “Fairwinds Animal Shelter”. 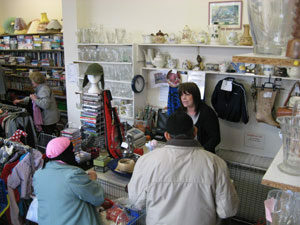 We rely solely on donated goods for re-sale in the shop. Suitable items include Bric-a-Brac, Ornaments, Crockery and Kitchen Utensils, etc, Linen and Curtains, Good Clothing, for all ages, Shoes and Bags, Toys and games. We can also accept small items of furniture including tables and chairs. Upholstered furnishings must have the “kite mark” by law. No electrical goods, thank you. We request that all donated items are in GOOD SALEABLE CONDITION. Goods can either be delivered to the shop – during our opening hours please – alternatively, collection can be arranged ( Usually within one week); please contact our collection volunteers on 0116 241 2858 or 0116 273 6515. Please do not phone or deliver to the animal shelter.